This operator can be useful in cases when we need to perform pattern matching instead of equal or not equal. The SQL Like is used when we want to return the row if specific character string matches a specified pattern. The pattern can be a combination of regular characters and wildcard characters. To return a row back, regular characters must exactly match the characters specified in the character string. The wildcard characters can be matched with arbitrary parts of the character string. Let’s use the AdventureWorks sample database and see some different SQL Like operators with ‘%’ and ‘_’ wildcards. 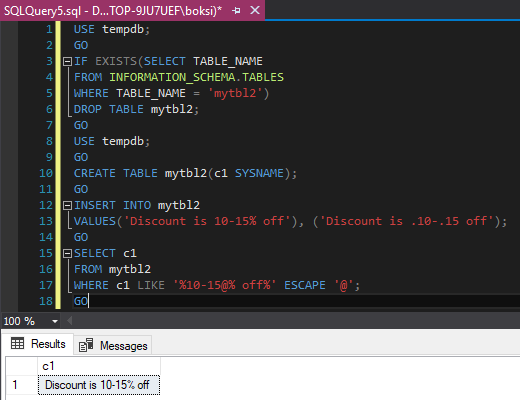 The SQL Like underscore character e.g. „ is used when we want to check a single character that can be anything and provide the rest of the characters for our match. I hope this article on the SQL Like operator has been informative and I thank you for reading.